If you’d like to purchase any of the following items, please contact me via email to order or to get more information. My ordering system is pretty rudimentary right now, so let me know what you’re interested in and we can work out the shipping and payment information. Four designs, and perhaps more to come! $2.50 each, 8 for $15. Envelopes included. 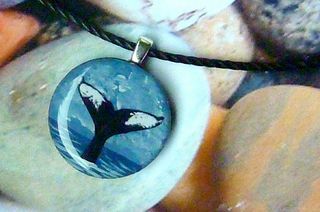 These pendants show the distinctive flukes of several of Southeast Alaska’s humpback whales. The base is wood, with handpainting and a clear resin overlay. They’re strung on a cotton cord or a chain (your choice) with magnetic clasp. $24. 32-page full-color children’s book about the American Dipper, a bird everyone should get to know. “Go and see him, and love him, and through him as through a window look into Nature’s warm heart,” said John Muir about dippers.$10.95. Plants, animals, landscapes, and more. 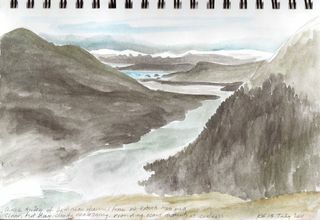 Pen and ink, graphite, watercolor, acrylic…and more.